THE successful launch of the £8 billion (RM43.6 billion) redevelopment of Battersea Power Station (BPS) in London is the result of hard work, tenacity and the coming together of visionary and creative minds. Among the visionaries is US-based Gehry Partners LLP, headed by internationally renowned architect Frank Gehry. City & Country had the chance to catch up with the company’s partner and principal designer Craig Webb, who was in Kuala Lumpur to give a presentation on BPS recently. “All I could ever think of is, make it better, make it better,” says an enthusiastic Webb, as he explains the firm’s painstaking design process for the South London landmark. Gehry Partners is responsible for the design of Prospect Place, BPS’ most prestigious commercial and residential components, which is due for completion in 2019. Anchoring the design is Flower Building, a blossoming façade that features penthouses and apartments with facilities such as a lounge, library, yoga studio and meeting rooms. Webb, who has worked alongside founder Gehry for 24 years, reveals the start of their BPS journey. “It was a design competition by the developers that first got us involved with the project. I think my partner, Frank (Gehry), was sceptical at first, as the Foster + Partners’ (an architecture company) office is situated right next to the project site. We thought we would never stand a chance, but we gave it a try, and we were glad we made the scheme,” he says. Foster + Partners is in charge of the designs of the Battersea Rooftop Garden and The Skyline building. “Essentially, the thing that attracted us to the project was the developers. I believe our ideas are aligned. At our end, we wanted to focus on creating a neighbourhood, a place where people can feel at home. 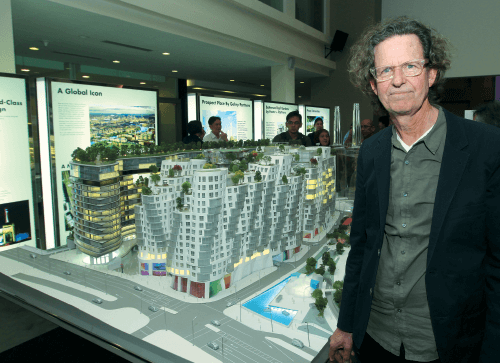 And the developers had strong concepts for placemaking surrounding the iconic power station, with a lot of mixed-use activities,” says Webb. BPS is owned by the Malaysian consortium of S P Setia Bhd, Sime Darby Bhd and the Employees Provident Fund. Over the last five decades, the Los Angeles-based architecture firm has built an extensive and diverse portfolio of design projects, ranging from designing deconstructive commercial buildings and sculptural furniture to collaborating with jewellery retailer Tiffany & Co. Some of its renowned works include Walt Disney Concert Hall in Los Angeles, Massachusetts Institute of Technology Ray and Maria Stata Center in Massachusetts, Louis Vuitton Foundation in Paris and Guggenheim Museum in Bilbao, Spain. Declared “the most important architect of our time” by Vanity Fair in 2010, 86-year-old Gehry became a global phenomenon for his non-conformist designs, concocting the most grandiose of design schemes and manipulating highly structural materials such as steel and glass. Most recently, the company completed Facebook’s first headquarters in Los Angeles, featuring a nine-acre green roof top. Still, Prospect Place in BPS is an unfamiliar territory for Gehry Partners, being its first major venture in London. A lavish confection of coloured titanium and glass, Flower Building is poised to become BPS’ most expensive building yet, with 1,305 apartments priced between £495,000 and £3.2 million for 4-bedroom units. Prices for Flower Building’s exclusive penthouses are only available upon request. 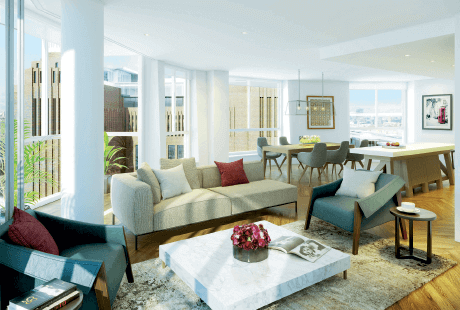 Prospect Place’s chic, 1930s-inspired buildings will feature a children’s park, a community hub and entry points for the Northern Line tube station. Flanked by the cities of Westminster and Chelsea, Prospect Place will have cafés, restaurants and high-end boutiques. Prospect Place and Flower Building will be developed in two phases — Phases 3A and 3B — to allow for the construction of the new Zone 1 tube station in the southern half of BPS. The northern section of Phase 3 will be completed by end-2018 and the southern half, by 2020. The entire BPS project is scheduled for completion in 2025. For Phase 3A, its large-scale international launches in 13 cities — Kuala Lumpur, London, Singapore, Tokyo, Hong Kong, Beijing, Shanghai, Dubai, Qatar, New York, Milan, Paris and Los Angeles — last October, marked the project’s aim for a global audience. Phase 3B, which includes Flower Building, is expected to be launched next year, once the Northern Line extension station is completed. Work on Phase 3 is due to start in 4Q2015. A total of 3,992 homes are to be built on the 42-acre site. The redevelopment is forecast to create 17,000 new jobs. When it is completed, it will have some 25,000 people living and working there. Gehry Partners is working closely with other high-profile architecture companies such as Bjarke Ingels Group, Foster + Partners, de Rijke Marsh Morgan, Ian Simpson and Wilkinson Eyre in this project. These firms have been appointed to design specific buildings for Rafael Vinoly’s master plan for BPS. Despite its exorbitant prices, Prospect Place has been selling well among Malaysian and other foreign investors, with a take-up rate of 60%, since its launch. Phases 1 and 2, which were launched in 2013, saw take-up rates of 99% and 89% respectively. “The overall response has been positive. We are very excited about the project and have been working on keeping our budget, our schedule and all of the logistics,” says Webb. “The thing that sets Prospect Place apart from the rest of the projects we have done is that it is in London. We really try to capture the spirit of London, the different elements of the city and contextualise it in our buildings. It is the combination of the city, different contexts of the city, different building types and the client that makes BPS a standout project,” he adds. Some of the design specifications are made especially for the Malaysian developers and the target market. “For the residential component, we integrated a ‘mix’, that is a typology of the apartments, which determines whether it will be a studio, 1 or 2-bedroom unit. The mix also establishes the minimum and the maximum space of a room within a certain range, for example, the width of the kitchen and closet. The developers gave us a design brief that is based on market research and their international target market. And almost always, the mix and design specifications change during the design process,” says Webb. He says the collaboration between the other designers is vital for BPS’s design. Despite the companies’ different design aesthetics and approaches, BPS is able to achieve a sense of cohesion. “BPS is a major redevelopment. The whole point of the project is for BPS to become part of London, and not a separate enclave. The collaboration between the architectural firms, designing different buildings for BPS makes it more special and diverse. At the beginning stages, the developers had planned for it to be designed by a single firm, but later on, they decided to collaborate with more companies to add heterogeneity. I think it’s a brilliant move,” he says. For its preliminary design process, Gehry Partners used its age-old formula of playing with wood blocks. “Our method has always been practical. We would start off with blocks that are very specific to the needs of the buildings. We played around with them and compared them to Rafael’s (Vinoly) original master plan. The initial design was a single, long building, but we found that it would be too enormous,” says Webb. “Our first instinct was to break it apart, and through the process, we decided to break it into five different parts for Prospect Place. We realised that the five buildings would introduce two openings for high streets and one opening for the children’s park. Then, Gehry had an a-ha moment to place another building in the middle to sharpen the overall design. “When we first designed Prospect Place, especially the building in the middle, we realised that it started looking more and more like a flower. Hence, its name, Flower Building. One thing that is unusual about the building is that it is larger on top, so we went ahead and added more design elements to make it appear more like a flower. The design process took an excruciating few months. “It is a slow step-by-step process. For the competition, which took about two to three months, we had submitted a simpler design version. Upon winning the competition, we redesigned Prospect Place all over again to improve its overall composition, and that probably took an additional two months,” he says. All Phase 3 homes are designed to achieve the Building Research Establishment Environmental Assessment Methodology excellence. BREEAM is an environmental assessment that sets the standard for the best practice in sustainable design, construction and operation. The homes will achieve Level 4 of the code for sustainability. According to Webb, the firm places great emphasis on sustainability for BPS and other projects. “Another example, the Facebook headquarters, is green for a number of aspects. We converted the warehouse to bring in as much natural daylight with a system designed to minimise artificial lighting and power consumption. It is also becoming mandatory for most buildings to have thermal-performance walls and roofs to insulate heat,” he says. “The most challenging part in designing Prospect Place is figuring out where to site the Tube (Northern Line extension). The design composition for the Tube station is a little out of sync for us, a little behind us, so we are in the midst of figuring out how to make the designs work together. We really try to create a linkage between the amenities, such as the children’s park and community hub, and the entry points of the Tube. 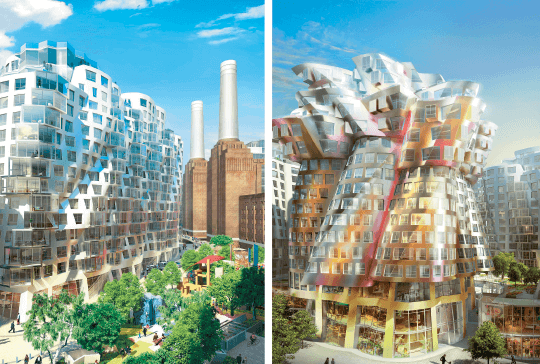 Apart from BPS, Gehry Partners is eyeing other projects. “There is a rumour that there will be a new concert hall in London for the London Symphony Orchestra. We would love to pursue projects like that. Gehry and I are incredibly passionate about music and we love designing music-related schemes. For now, we have a Chamber Hall that is under construction in Berlin, Germany, for the East West Orchestra,” says Webb. 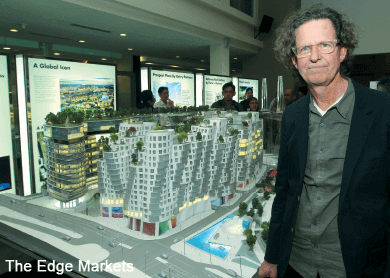 On BPS’ avant-garde development blending with the rest of the traditional architecture in London, Webb says it creates a modern dialogue for the city. “I think there is a lot of contrast between the modern and traditional buildings in London. BPS’ enormity acts as a ballast for the other elements of the surrounding buildings, the new and the old, to blend together. In the past, most of the buildings we designed were astonishingly sculptural, but there had always been rectilinear pieces that balanced the designs. The traditional nature of BPS allows us the freedom to design the sculptural pieces such as Flower Building. This article first appeared in City & Country, The Edge Malaysia Weekly, on May 11 - 17, 2015.